Designed by Melbourne’s McBride Charles Ryan Architects to reflect Monash University’s aim to create true communities in quintessentially Australian style, the new Logan Hall student accommodation at the Clayton Campus combines sustainable design and construction to achieve a 5-star-as-built rating from the Green Building Council of Australia. Completed in December 2015, the development includes 250 studio rooms, as well as shops and cafes on the ground floor, creating a vibrant urban feel. Features such as fixed shading, high performance glazing, and thermal mass and insulation help transform the building into a durable and sustainable structure. The construction of Logan Hall was successfully completed thanks to the quick and efficient brick inlay system, supplied by Robertson Facade Systems. 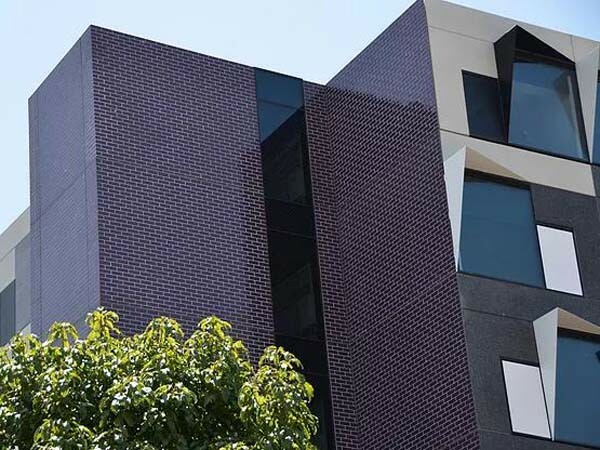 The brick inlay system was used to fit custom made magenta and cyan glazed brick facing tiles to concrete panels by Westkon Precast at their factory for the building’s facade. The glazed tiles add colour and character to the building while the brick inlay system has helped create an exceptionally hardwearing and resilient facade that will last the building’s lifetime, with no ongoing maintenance costs. Environmental best practice has ensured the new building effectively manages solar gain and maximises natural light. The understated variations in the panel shapes of the brick facades manipulate the light and provide natural variegation.